At first I thought that this would turn out to be Mr E under a different name, but the Listener website says otherwise and we were dealing with a new collaboration of setters. This week, not all entries would be real words. That always makes my heart miss a beat. Also, the “Final Answer” had to be written below the grid, but there was no indication as to how we were to arrive at it — perhaps the six unclued would be something like ONE HUNDRED AND TWO PLUS THREE?! Despite 8ac It’s dangerous to inspire return of soul in Nancy’s composition (3), and its obvious reference to a French word (Nancy being a city in France), I failed. [Bet Miss Terry loved misleading you. Ed.] The acrosses continued to be elusive until another French word cropped up at 21 with ETAT. After that, NGAIO dropped in and I wondered if all the entries were words of foreign origin. 4dn ARMOURED CAR made me feel a little happier with my progress, but 16dn THREADLET needing to go into a 3-letter entry squashed that. 23dn LOWER going into a 2-letter space helped really squidge my feelings. A few clues later, and GARAND RIFLE 26ac perked me up a bit, and with 29ac FERACITY going into a 4-letter slot beginning with C, I wondered if FEAR needed dropping, an emotion referenced by the title. Returning to THREADLET and LOWER, HATRED and WOE were likely candidates to be dropped there. I’d like to say that this information helped me finish all but the unclued entries in double-quick time, but this was a Listener, so no such luck. 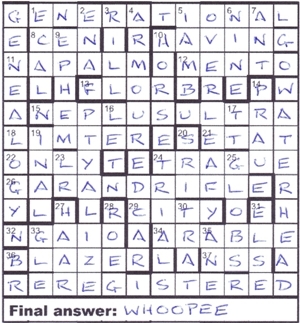 With a few clues in the top-left corner being tough, the long unclued entries at the top and bottom weren’t forthcoming. PTYALIZE in column 4 looked an obvious entry as was OVERLEAF in column 9, but did the preamble’s “all constructed in the same way” mean that they had lost an emotion. What did they start out as then?! Along the bottom, DEREGISTERED looked likely with GREED being its mixed emotion, but where the ISTERED came from was a mystery. Until 33dn Myrtle’s holding instrument for wide-eyed creature (3) finally got solved as GAZELLE, entered as GLE and dropping ZEAL. Back to PTYALIZE and there we had an anagram of PITY and ZEAL. So the unclued entries were anagrams of two of the emotions dropped elsewhere. Eventually, I sussed the top-left corner: 1dn was ETYPICAL, entered without PITY and 8ac was CYANOGEN minus AGONY to give CEN. And good old 2dn Well-born girl reversing final answer (3) was nothing to do with what went under the grid, but referred to 35dn A Scottish academic computing network without peripherals (3) ENA!! Brilliant stuff. These guys must have a degree in sneakology! All that was left was to add HOPE (TOPHET) to WOE (LOWER) to give the Final Answer, and my BGM (Big Grin Moment), WHOOPEE. It was nice to see everything come out in the wash. Thanks, Miss Terry. Great fun. Interesting fact: neither Chambers Crossword Dictionary nor Mrs B lists LOVE under emotion, but both give HATE! This entry was posted on 2 February 2018 at 4:00 pm	and is filed under Solving Blogs. Tagged: Miss Terry, Mixed Emotions. You can follow any responses to this entry through the RSS 2.0 feed. You can leave a response, or trackback from your own site.